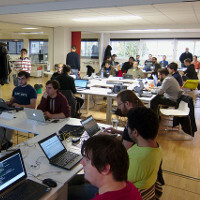 The 2018 Web Engines Hackfest took place in A Coruña, Galicia, Spain from Monday, October 1st to Wednesday, October 3rd. Igalia has been organizing and hosting this event every year since 2009. This is a hacking oriented invitation-only event. The event involves members from all parts of the Web Platform community, including those who work on Chromium/Blink, WebKit, Firefox/Gecko and Servo. Check the list of confirmed attendees for more details. 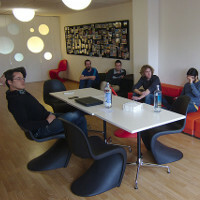 The event has an unconference format and the first step is the creation of small focused teams. Attendees should feel free to propose any topic which interests them. In addition, you can check the talks from this edition on this website. Visit the hackfest wiki page with scheduling, breakout sessions and all the information related to the event. The Web Engines Hackfest used to be known as the WebkitGTK+ Hackfest, which has been held since 2009. Information from previous years can be found on the following pages: 2009, 2010, 2011, 2012, 2013, 2014, 2015, 2016 and 2017. This year we have people from several companies and organzations working on the Web Platform: Apple, ARM, Bocoup, Collabora, CoSMo, Google, Hulu, Igalia, Intel, LGE, Mozilla, Naver, Red Hat, SoftAtHome and Sony. A Coruña airport (LCG) is connected to Madrid, Barcelona, Lisbon, London/Heathrow. To get to the venue from A Coruña Airport, use the Airport-City Center Bus line (Line 4051 Centro da cidade - Aeroporto.) - Stop at Bus Station (Estación de Autobuses). Santiago airport (SCQ) is connected to Madrid, Barcelona, Brussels, Dublin, Frankfurt, Istanbul, Basel/Mulhouse, Geneva, Milan/Bergamo, Paris/CDG. About 50km from Coruña, it's a good option if you have a direct flight, but requires taking the bus to the Santiago train station and then the train to Coruña. Train and bus connections to A Coruña are available from all major cities in Spain. The train and bus stations are a short walk from the venue and hotel. Train tickets are available from Renfe. Bus tickets are available from ALSA amongst other carriers. It is also possible to drive to A Coruña. Driving directions to the Igalia offices. We recommend staying in Hotel Avenida, which is a five minute walk from Igalia's office and is offering a discounted rate for hackfest attendees. If you would like us to book your reservation at the Avenida, please let us know the room size (single or double) and name(s) under which we should book the room. If you would prefer to book your own reservation at the Avenida, be sure to mention Igalia in order to get the event rate. Igalia is dedicated to providing a harassment-free experience for everyone, regardless of gender, gender identity and expression, sexual orientation, disability, physical appearance, body size, race, or religion. We do not tolerate harassment in any form. This policy applies at Igalia's offices, all event social gatherings, on event mailing lists, bug trackers, wikis, and all other online services. Try not to become defensive when someone takes issue with something you say or do, in relation to the code of conduct. Simply apologize and stop doing whatever it is that caused the discomfort, even if you feel that you are wrongly accused. We are all responsible for building and maintaining a comfortable and safe environment. Continued or severe breaches of the code of conduct should be reported to the Igalia anti-harassment committee, event organizers, the Igalia assembly, or the Igalia partners. When you are one of these people, it is your responsibility to respond properly to a breach of the code of conduct. People who breach the code of conduct may be asked to leave an event, take a break from mailing lists or chat, or even banned from future events in the case of severe breaches. +34 951 204 164 and then enter the PIN 1818 followed by the hash sign ('#'). Except where otherwise noted this site is licensed under Creative Commons Attribution ShareAlike 4.0 Internacional license. Photos by Adrián Pérez de Castro and Mario Sánchez Prada with their own Creative Commons licenses. Website design is based on the Agency theme by Start Bootstrap with Apache 2.0 license.